The relationship between businesses and their channel partners is evolving. There are new resources, shifting communication methods and fresh opportunities for your business and partners. But how do ensure you and your partners are on top of it all? Partner enablement is a concept that has been around for years, but now it’s more necessary than ever. It provides your partners with the assets they need to be successful and it keeps you ahead of the game. With a partner enablement strategy becoming increasingly important, it’s essential that you integrate one into your business. Here’s an explanation of partner enablement, why it’s so vital, and the types of partner enablement training you can introduce to drive your revenue. 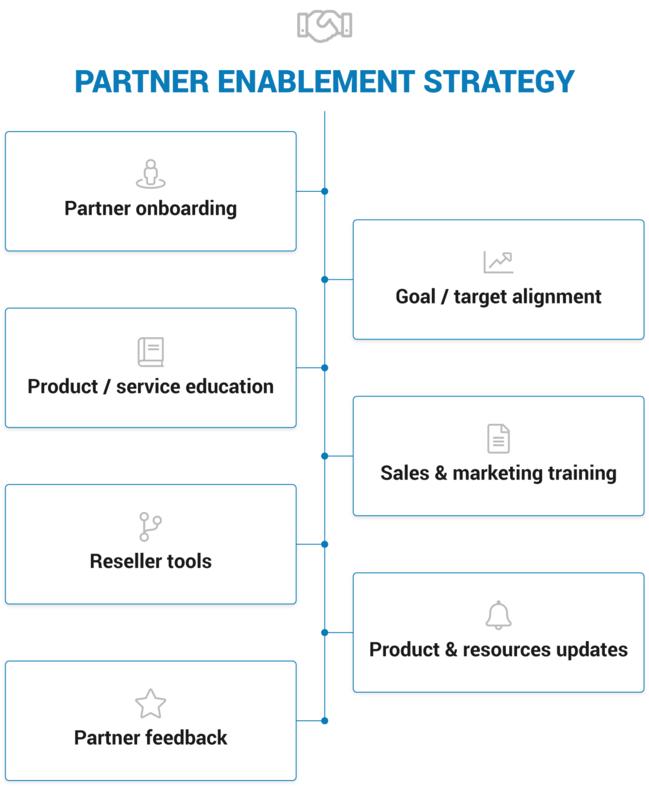 Channel partner enablement is supporting your partners with the necessary training, tools, and resources they need to successfully sell and maximize your revenue. It’s also known as reseller enablement, channel enablement, or sales enablement channel management. Partner enablement not only provides information about your products and services to your partners, it goes beyond that. It imparts your brand’s vision, aligns your partners with your business’s overall strategy and empowers them to appropriately represent your business. Why is partner enablement important? Partner training and channel partner enablement have measurable wins for your business when done right. By providing education and resources, your partners have an increased chance to perform better. They market your products or services better, increase your sales, help you build a stronger brand and their need for your support in all of the above is reduced. Healthy business-partner relationships are achieved by supporting your partners through training. Training that equips each partner with the resources they need. Onboarding is the first, and most critical enablement step. It welcomes your partners aboard and introduces them to your brand. At this step, you should introduce your partners to the team members, general information about your business and get them prepped to be strong and active parts of your channel. Introduced in your onboarding or continuously updated throughout your training, it’s important to lay out targets and expectations for your partners. Clearly outlining the targets you expect from your partners increases the chance they’ll reach them. Your partners should know the ins and outs of your products and services and through proper training, you can easily ensure this. Knowing every detail will increase their ability to share that knowledge with their prospects and increase sales. To market and sell partners need to know more than just the product specs. They need to know the methods of marketing and selling that are most impactful. Offering training on what resonates with your audience and past sales success stories aids them in their efforts. Providing the best tools available to your partners is a smart move, but you should also train them in how to use them. Whether it's a communication tool, partner management tool, marketing tools or sales tools, train them effectively and they’ll be more productive and serve you better. Delivering training when your partners first come aboard is a smart move, but you also need to keep them up-to-date on product updates and resources as they become available. Running annual training sessions that refresh your partner's product knowledge is a surefire way to keep them in the loop. You can also issue certifications when they’ve completed this training as proof-points that they are fully qualified to sell, install and use your product. Lastly, partner enablement training should be a two-way street. Your business trains your partners and in turn, they give invaluable feedback. Through online surveys or face-to-face feedback, you can discover how to improve your business, product or service and enhance your partner training program to get better results. Train your partners with LearnUpon. The powerful learning management system that has the features and knowledgeable team you need to achieve training success. Get your free trial and demo today!